Everything You Need to Know To Throw the Best-Ever Tailgate! Assure a tailgate triumph with your College Edition Q and these tailgating tips! Admit it--you haven’t stopped thinking about tailgate season since the moment it ended. In preparation for the upcoming season you are on the prowl for a vintage shirt you can rock at every single game, a tailgating playlist of straight perfection, and Instagram captions that will break your current “like” record. Now it’s time to choose what is going to separate your tailgate from the millions of other diehard fans who show up hours before game time to reserve their spot by following 3 very simple steps. Step 1: Let the grill do the talking. Why is your tailgate this year’s hot commodity? Let me tell you. You. Have. Your. College. Logo. Embedded. On. Your. Grill. One look at the College Q and you are hit hard with butterflies because you know its love at first sight. When a grill contains the same passion, the same pride, and the same beautiful logo as your school, it transforms your experience into more than just a tailgate—it’s a grillationship. The College Q amplifies the taste of the hotdogs and brats you are grilling because they are being doused in school pride. 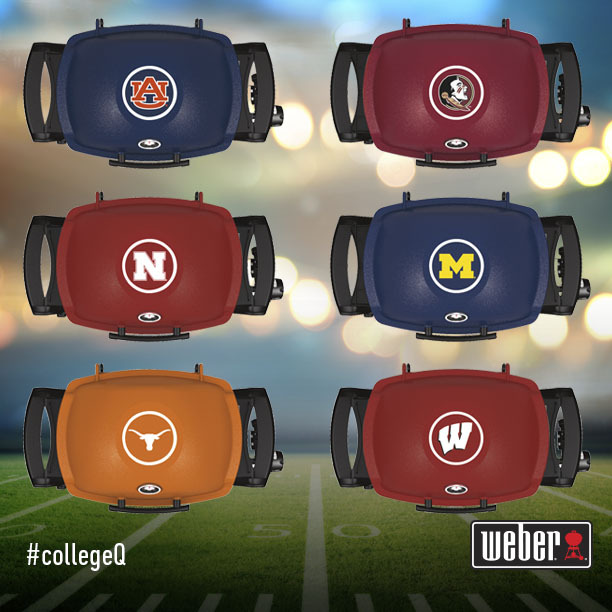 The College Q hits an all-time high of school spirit and basically sings your fight song every time you open the lid—it is the Anthem of all tailgating grills. Use this tactic to draw members of the crowd in with one more key element—the smell of a grilling victory. Step 2: Give the people what they want. Owning the College Q already allows you to chalk up a #tailgatingwin, but now let’s focus on what’s inside the hood. The people have spoken and what they want is to fill their taste buds with great food, fresh off the grill. Just thinking about BBQ chicken dip and Grilled Skirt Steak Skewers gets the glands salivating. Trust me, you will be all over everyone’s SnapStory looking like a real grillmaster with either one of these dishes and some tongs in hand, AND if you hit the right flavors, people will be talking about the food for weeks! Step 3: Look good, grill great. 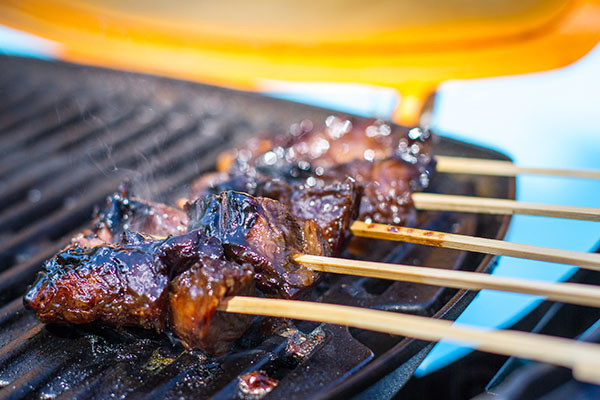 Grill brush—you don’t want this tailgate tasting like your last tailgate. Tongs & Spatula—forget the fork! Use tongs or a spatula to maneuver your food and get the perfect sear marks on both sides. Weber Seasonings—add a punch of flavor quickly and easily with our seasonings! Premium Barbecue Glove Set —keep your fingers safe while showing off your grill skills and warm during those frigid games!